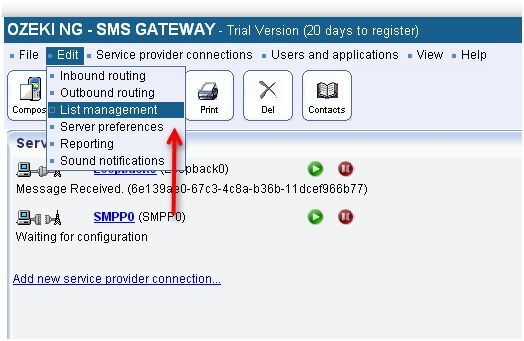 This chapter provides instructions on how to install and configure the List Management for SMS filtering using the Ozeki NG SMS Gateway software. The List Management is a filtering option, which lets you filter your inbound and outbound messages with a list of telephone numbers. You can configure List Management using the graphical user interface of Ozeki SMS Gateway. Click Edit on the menu and choose the List Management option that you can see in Figure 1. Figure 2 shows two options available for you to create your new telephone list. You can create a new empty list by clicking the "Add new list" option, or import an existing phone list by clicking "Import list". Figure 4 shows you how to import a list file. The list file have to be in .txt file format and every telephone numbers have to be in new lines. The following picture shows where you need to provide the name of the list and choose the list file. Figure 5 views the List management menu where your can find your created lists. Clicking on the Export button you can save the phone numbers to a .txt document. If you are done creating your new list, head to the Inbound or Outbound routing menu to set your rules to filter using this new list. 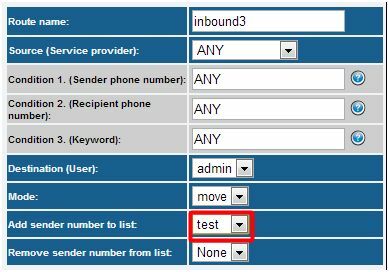 In Figure 6 you can see how you can add sender number to list, or remove sender number from list in case of an incoming SMS message. If you would like to add the phone number of the sender to a list or remove a phone number from it, you need to choose the name of the list from the "Add sender number to list"/"Remove sender number from list" menu. 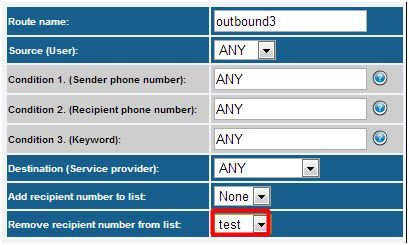 Figure 7 shows how to add the recipient phone number to a list or remove it in case of an outgoing SMS message. 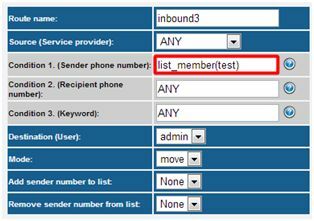 Choose the listname from the menu which belongs to the "Add recipient number to list" or "Remove recipient number from list", and the phone number will be added to the list or deleted from it. Figure 8 shows how to filter SMS messages based on a list. You can use the list_member(listname) and the not_list_member(listname) methods in Condition 1 (Sender phone number) or Condition 2 (Recipient phone number) text boxes. If the list_member(listname) method is used and the sender phone number is member of the list, the SMS message will be forwarded to the destination. If the not_list_member(listname) method is used and the sender phone number is not member of the list, the SMS message will be forwarded to the destination. If the list_member(listname) method is used and the recipient phone number is member of the list, the SMS message will be forwarded to the service provider connection. 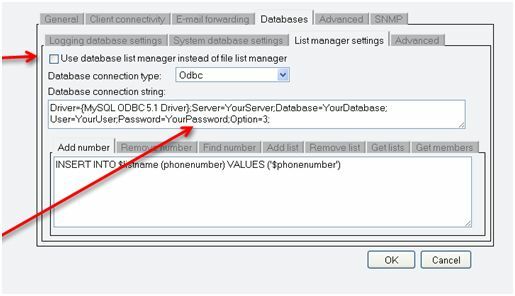 If the not_list_member(listname) method is used and the recipient phone number is not member of the list, the SMS message will be forwarded to the service provider connection. By default lists are stored in files. Instead of storing the lists in file system, you can save them into database. You can activate it under Edit / Server Preferences menu. Choose the Databases tab and then the List manager settings tab. You need choose the Database connection type and give the database connection string. You only need to create a new database without any tables and give its name in the connection string. The Ozeki NG SMS Gateway will create the tables for the lists. It is possible to send one SMS message to the members of a list. Figure 10 shows you how to give the recipient phone number. If you wish to store the phone numbers in MS SQL database, you need to modify the Add list and Get lists tabs. If you have any other questions, please contact us at info@ozekisms.com.